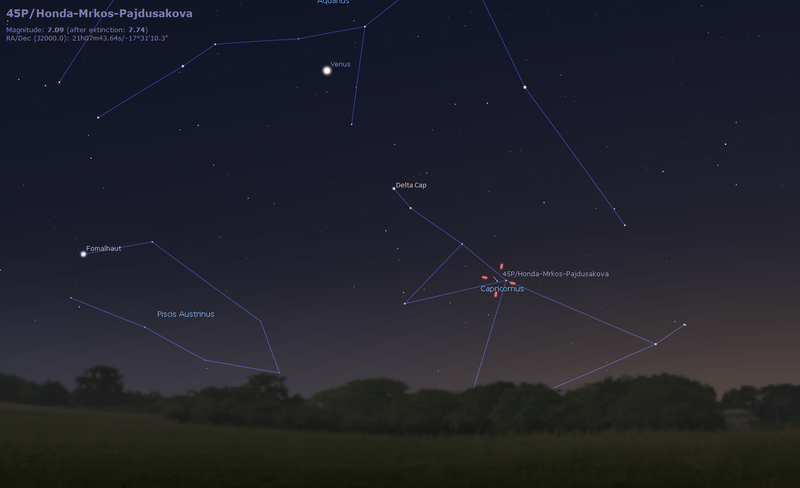 My challenge for the next two days (Clear Sky Chart is predicting clear skies) is to observe and capture comet 45P/Honda-Mrkos-Pajdusakova. It should be relatively easy to locate by hopping from Venus then down the bright stars of Capricorn starting with Delta, Gamma, Iota and ending with Theta. Then half a degree to the left of Theta Cap is magnitude 6 star HD201057. Comet 45P at magnitude 7 should be just next to that star. The challenge will be its position low near the horizon, I may have obstructions before it sets. And the twilight may not be dark enough for a magnitude 7 object. The viewing time window will be quite small…wait for darkness and it will fall out of view. No need for telescope, it’s also a binocular object. 45P is the 45th periodic comet (Halley being the 1st identified periodic comet) with a 5.3 year period. Its orbit swings from just past Jupiter to in between Mercury and Venus. This entry was posted in Chart, Observing and tagged Astronomy, Comet, sky chart by Benoit Guertin. Bookmark the permalink.